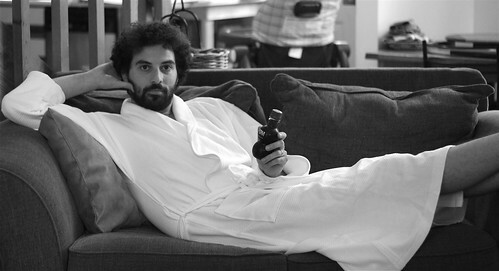 Hyatt Prize: Robe and Pom, a photo by happyjoelmoss on Flickr. As part of the awesome prize that I won from Hyatt, not only will my family be spending a week in Aruba at the Grand Hyatt Aruba, but I also got a box with THE MOST COMFORTABLE ROBE THAT HAS EVER EXISTED! I now know why people steal robes from hotels. The reason I have never been tempted before is because I’ve never stayed at a hotel as nice as a Hyatt, but this robe changes EVERYTHING. I also got a case of Pom, which you can see me casually drinking as I lounge. Just practicing for Aruba. Awesome. What is with the beard though? Growing it out for Atlas’s wedding which I’m officiating. That was his only dress requirement! Thanks! We gotta figure out some more entries to make together!